Bacterial colonies often consist of heterogeneous communities rather than genetically identical cells with harmonized gene expression profiles. Dramatic changes, such as the onset of infection, may perturb a colony’s sociomicrobiology leading a minor subpopulation with a mutant phenotype to prevail in the host; however, capturing such transitions in real time is difficult. While differential microarray analysis has become a method of choice for comparing the transcriptomes of bacterial subpopulations, current microarray analysis tools are more optimized to the study of eukaryotic organisms. Here, we set out to develop a systems biology model for studying the transcriptional reprogramming underlying the transition of M1T1 group A streptococci from a virulent to a hypervirulent phenotype [3–5]. In addition, we aimed at integrating and optimizing microarray analysis strategies to better understand bacterial regulatory networks. Using a murine subcutaneous chamber model developed in our laboratory, we sampled the bacteria before and 24 h after infection, and we compared the transcriptomes of wild type (WT) and animal-passaged (AP) bacteria in vitro and in vivo (Figure 1). To make biologically relevant discoveries without compromising the statistical robustness of microarray analysis, we combined multiple analysis strategies, including coexpression clustering, neighbor clustering, and subsystems analysis. Finally, we visually inspected all computer-generated data to filter out any artifacts or errors. Outline of the design of microarray experiments. The integration of these methods revealed extensive transcriptional alterations of pathoadaptive and metabolic gene sets associated with invasion, immune evasion, and metabolic reprogramming. Comparing genomic subsystems involved in in vivo adaptation with those affected by animal-passage demonstrates that the WT bacteria struggled to adapt to the host environment by altering several virulence and metabolic modules that made their phenotype more similar to the mutant AP phenotype; still, WT bacteria failed to survive while the AP population thrived mainly because of a mutation in the gene encoding their global environmental sensor, CovS. We suggest that the transcriptional reprogramming of the WT bacteria was not sufficient for their adaptation to the host environment and that niche adaptation was only achieved by the selection/expansion of covS mutants. 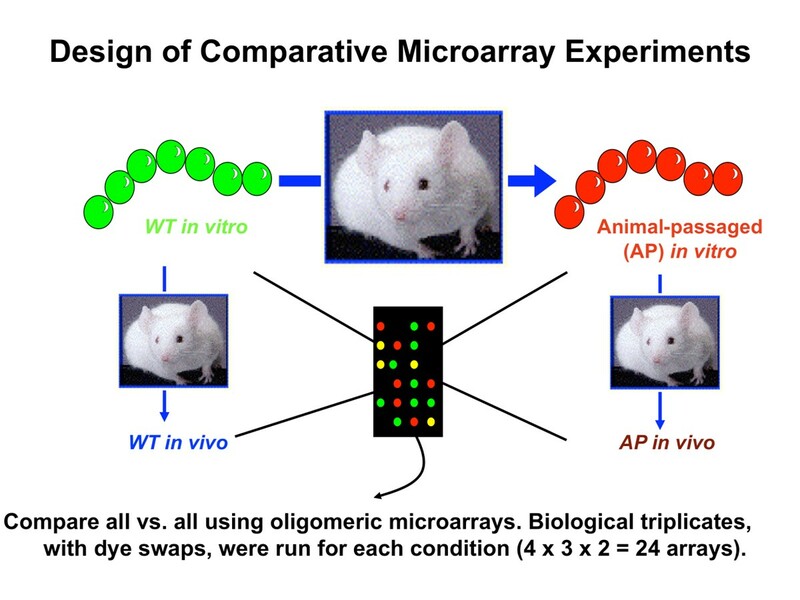 This model allowed us to capture transcriptional snapshots of both survivor and extinct subpopulations in vivo and provided a proof of principle that in vivo transcriptomics of extinct microbial populations offers valuable clues to microbial niche adaptation. The integration of multiple microarray analysis tools and the customization of these tools to bacterial polycistronic transcripts demonstrate the importance taking biological relevance into consideration in high-throughput data analyses. This work was partly supported by the Research and Development Office, Medical Research Service, Department of Veterans Affairs (Merit Award to MK), and by the National Health and Medical Research Council of Australia (project grant 459103 to MJW and MK). A detailed study describing the experimental model and the implementation of these methods in the analysis of group A streptococcal hypervirulence was recently published.